Our offices at 54 St James Street are full of unique and interesting businesses. We want you to get to know them! 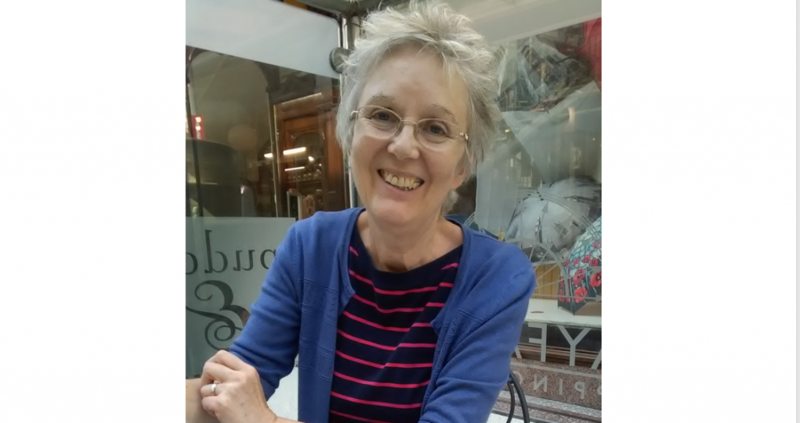 So, we spent five minutes with our tenant, Caroline Barden, Proofreader extraordinaire. A friendly face around 54 St James Street, we first met Caroline back in 2016 when she received start up business support through The Women’s Organisation. Two years on and Caroline is a part of the furniture – she even proofread our book Twenty One: 21 stories of women who shaped our city! I am a freelance editor offering proofreading and copy-editing services to individuals and businesses. I first contacted The Women’s Organisation for help and support in the autumn of 2016 following my redundancy. Six months later I was ready to go – and I haven’t looked back since! I have worked for some clients who have had brilliant success stories, including students whose manuscripts have met the grade and authors whose books have been published for sale. I was also privileged to be asked to proofread The Women’s Organisation’s book Twenty One – a wonderful project and a wonderful book. I love being able to arrange my own timetable. My projects involve close work and I have regular breaks to keep my mind fresh. Tai Chi is great for clearing my thoughts; or a brisk walk is refreshing, to the park or down to the shore. I try to spend a short time on marketing, I like to keep in touch with clients or reach out to new ones by email or LinkedIn. When working on manuscripts I have to be logical and organised. I have lots of reference books that I stack around my computer, and my online dictionary is always turned on! As I set up my business, the business support and training courses at The Women’s Organisation seemed a brilliant place to start. I learned such a lot and talked to so many people. It was great to be in an environment with other new business owners – discussing our successes and worries! And so, it felt the natural thing to choose 54 St James Street as my office address. Although I now feel settled in my work, it is important to maintain contact with other businesses – regular newsletters from 54 St James Street help me to do that, and I attend the Business Club whenever I can. Believe in yourself – you can do it! Seek out support from those with experience. Keep learning, it will give you confidence and help you to stay up to date – check out the fantastic range of courses at The Women’s Organisation. Find courses relevant to your business too, they keep you in touch with colleagues who work in the same field and give you inspiration and ideas. And, something I’ve been caught out with, don’t forget your marketing even when you are busy, there may be lean times to come! What’s on your reading list at the moment? I love reading. Going to the library is a favourite trip, browsing the shelves for new books. I like to follow the seasons – last month it was ghost stories, and I shall soon be searching for Christmas recipes or tales of snow, ice and new beginnings! You can find out more about Caroline’s services online, here. Or find Caroline Barden Proofreader on Twitter, Facebook and LinkedIn.